The sun was setting, casting dappled shadows through the back yard…I allowed myself a few moments of pride in the vision I had 10 years ago when we moved into our little house in the woods. With limited funds…most of our money went into refurbishing the interior of the house…I slowly created a small garden with huge amounts of blooms and fragrance. Given the ever decreasing amount of direct sunlight during the day, I managed to position as many plants as possible where they would thrive with whatever light came their way. And now, I really do need to divide and transplant some things this fall as it is difficult to walk through the garden paths with so much spilling over…oh, that spearmint I just stomped on reminds me of how great the natural perfume is planted around an outdoor shower by the pool. ER, well… that was in our TEXAS house! Yet, it really is a good time of day to be out and about the garden…rain is forecast for later this evening so I need to pick some herbs and greens for my salad, also some rosemary and thyme for the goat cheese tart I am making for dinner. With the tart I plan to enjoy a bit of my favorite summer wine…one of my dear friends calls it …’the chicken wine’…My days and time spent in the garden give me such joy and many plants, a special memory. A bird house that looks like a purse hangs on a stake near the huge drift of phlox…a gift from my French sister, Jeanine, she knows how much I love nice purses…a fault that is definitely part of the female genes in my family. Of course we all love wine, too…hummm! The garden is an extension of my home…an outdoor room…it is a sanctuary, an escape from the pressures of life, a place where dreams come alive and I can be transported to gardens all over the world…just sit and close my eyes. What began as a vision has become an inspiration! 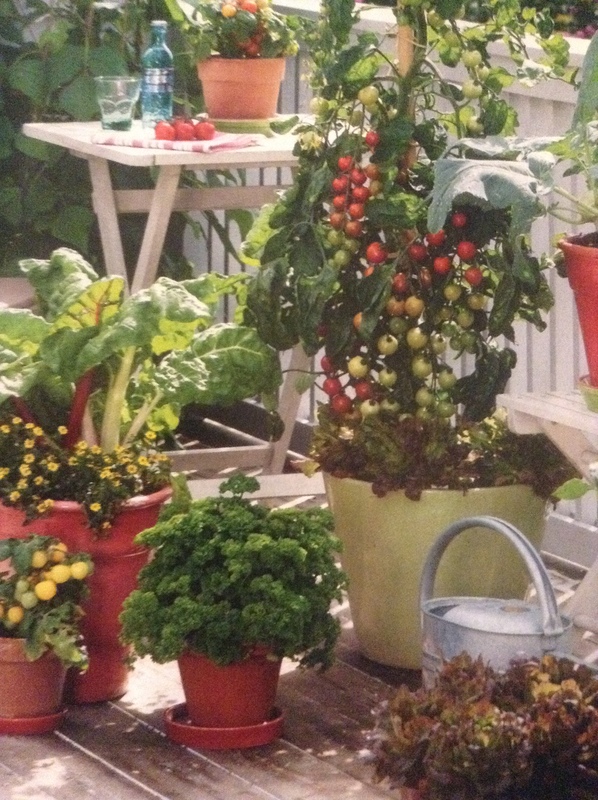 Grape tomatoes, chard, parsley and other herbs also do well in containers with proper care…good light, plenty of air circulation and water will insure a good crop for juicy summer enjoyment. HERBS have been used to flavor foods, cure ailments and create natural beauty products for centuries…herbs are so simple to grow and will add fragrance and texture to a garden. I am always amazed when clients talk about having such trouble with herbs…plant properly in the right spot, water and keep them in your thoughts. Outside the backdoor, all year ’round, I always have cooking herbs growing…for easy picking, of course! Onion chives, thyme, rosemary and oregano along with seasonal herbs such as basil, parsley, tarragon, and cilantro…fill pots to overflowing. 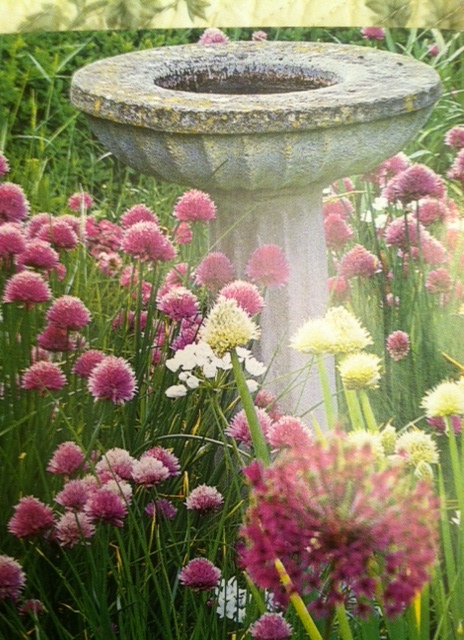 How lovely are the onion chives growing around the birdbath…they bloom in the spring and then provide tasty foliage I use almost daily for cooking…chives on scrambled eggs, on new potatoes with rosemary and lots of butter, in salads instead of onions…flavor without the sharp bite…and so much more. Fruity Ideas for small spaces…plan and plant for a delicious crop of fruit all summer…Shape to fit your space, espalier…simply a central trunk with horizontal or lateral side branches…an apple , pear, peach or other fruit tree to fit into a limited space. The theory here is that by slowing down foliage/vegetation growth you will increase fruit production. Be sure to choose self-pollinating varieties, or if you have the space, choose to have more than one cultivar that comes into flower together. 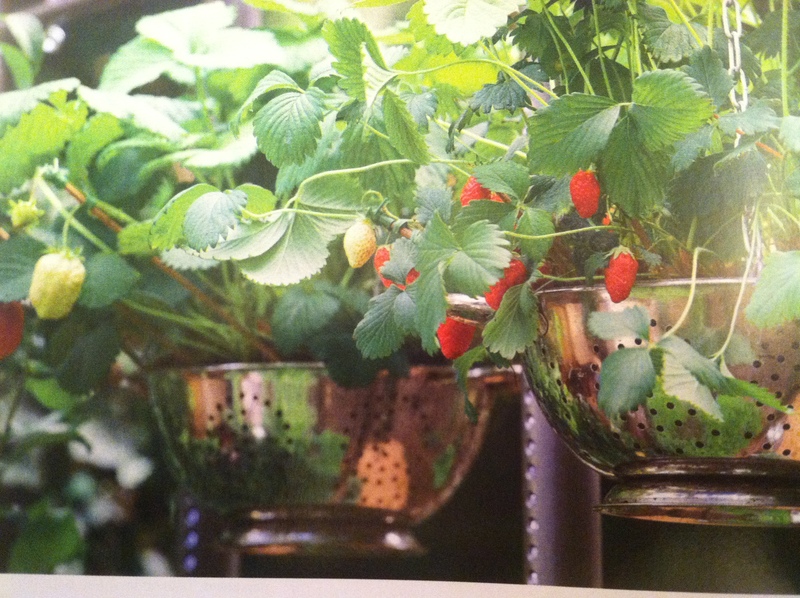 Speaking of strawberries…one of the glories of summer…of course I like to grow and pick my own everyday. But, if you buy them at a market, a few tips…look for bright scarlet berries, avoid a lot of white patches and smell them…ripe berries are intensely aromatic and their sweet fragrance comes through very easily, even in a plastic container. However, they do not keep well so use quickly and the more ripe they are the easier the hulls are to remove. I just rinse them off and drain in a colander, never allowing them to sit long in water. If you have more berries than you can eat or share…lucky you…BUT, strawberries do not freeze well and will turn to mush when defrosted. A better idea: mash or put in blender to chop and make a slush that when frozen can be used later for ice cream, smoothies, scones, toppings or anything else you can create. Strawberries combine well with cream, almonds, balsamic vinegar, orange, buttery pastry and CHOCOLATE! Create a so simple but delightful dessert…prepare a sweet tart crust and bake…mix together mascarpone, melted white chocolate and whipped heavy cream for the filling. Top with fresh berries…yummm! SIMPLE too is fresh berries topped off with a splash of Grand Marnier…sublime. When strawberries have finished producing…don’t forget or neglect the plants…trim any old dead/dying foliage, top dress with compost or light, very old chicken or rabbit manure and give them a good foliar spray with liquid seaweed solution once a month through the fall. Early June brings the pleasure of romantic roses and the aforementioned mouth-watering strawberries to the garden, along with luscious tomatoes steadily ripening on the vine…it is also the time to enjoy glimpses of my favorite visitors, aside from the deer who still come for dinner every night…butterflies and hummingbirds. Butterfly populations decline when there is destruction of habitats and loss of biodiversity…simply put…that is why I have plants and shrubs to attract and shelter butterflies, and plenty of nectar and host plants as well. You did plant some parsley, fennel, rue or dill…right?? This is where many butterfly babies are born and find food to grow. Something else butterflies love to snack on…watermelon, cantaloupe, honeydew or any other melon rind is a favorite snack bar for sweet juices. I always put the rinds with some melon flesh still attached up on wildlife feeders and tables throughout the garden. Sometimes the melon rinds are actually covered in butterflies nose down in the sweetness. As always I have gone on way too long…come back next week for more about the house, and my shady garden. A few parting thoughts…When life hands you lemons, roast them with chicken and potatoes! Dogs, with their perpetual TODAY-IS-THE-BEST-DAY-EVER attitude, could teach us a thing or two! Previous Article Roses, raindrops…and all kinds of everything! Next Article July…summer garden…sweet pleasures!